Communication is a catalyst for success. Partnering with families to enhance children's communication. Make a pattern with objects (i.e. buttons, beads, etc.) By putting things in order, children gain an understanding of sequence. This helps them discover that letters in words must go in a certain order. Listen to a story and then talk about it with their families, teachers. Children might talk about the plot, characters, what might happen next, and what they liked about the book. Children enjoy being read to. They learn that books can introduce people, places, and ideas and describe familiar experiences. Listening and talking helps children build their vocabulary. They learn basic literacy concepts such as: print is spoken words that are written down, print carries meaning, and directionality when reading. Play matching games Seeing that some things are exactly the same leads children to the understanding that the letters in words must be written the exact same way every time to carry meaning. Moving to music while following directions Children gain an understanding of concepts such as: up/down, front/back, and left/right. Recite rhyming poems and making up new rhymes on their own. Children become aware of phonemes – the smallest units of sounds that make up words, which leads to reading and writing success. Make signs for a pretend grocery store, restaurant, etc. Children practice using print to provide information. Retell a favorite story to another child or stuffed animal. 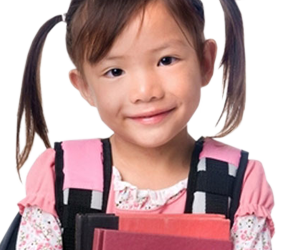 Allows children to gain confidence in their ability to learn to read. They practice telling the story in the order that it was told to them, many times using the “story book” language. Use invented spelling or scribbles to write a grocery list, letter, etc. Children learn that they can use writing to share information with others. By watching adults write, they learn to imitate the conventions of writing. Using invented spelling encourages phonemic awareness. Signing their names (by scribbling, drawing, using some or all of the correct letters) on an attendance chart, painting, letter, etc. Children learn that their names represent them and that other words represent objects, emotions, actions, etc. They see that writing serves a purpose.